80 inch Jumbo size Virtual Display, none radiation true color Micro LCD panel. Can be connected to PC and Laptop to enjoy work and entertainment seamlessly. 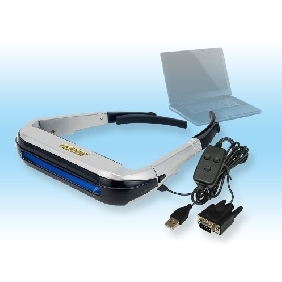 Easy plug and play, auto recognition between 640*480, 800*600 and 1024*768. With Incredible stunning 3D feature suitable for Nvidia Graphic card supported 3D games. Patent ergonomical design for eye protection from asthenopia, comfortable wearing. User friendly buttons for easy brightness control and 3D left/right eye switch. Unprecedented virtual reality gaming experiences.